(+	12.57 US$ ) Coude verchromt/chromé/chromed +Winkel/Coude/Bow? (+	6.73 US$ ) +Softspray + Softspray? Enjoy your shower – with a clean conscience! A 5-minute shower with a standard shower head requires 3 dl (!) of heating oil. Now you can save half that and still enjoy a full-bodied spray of water! 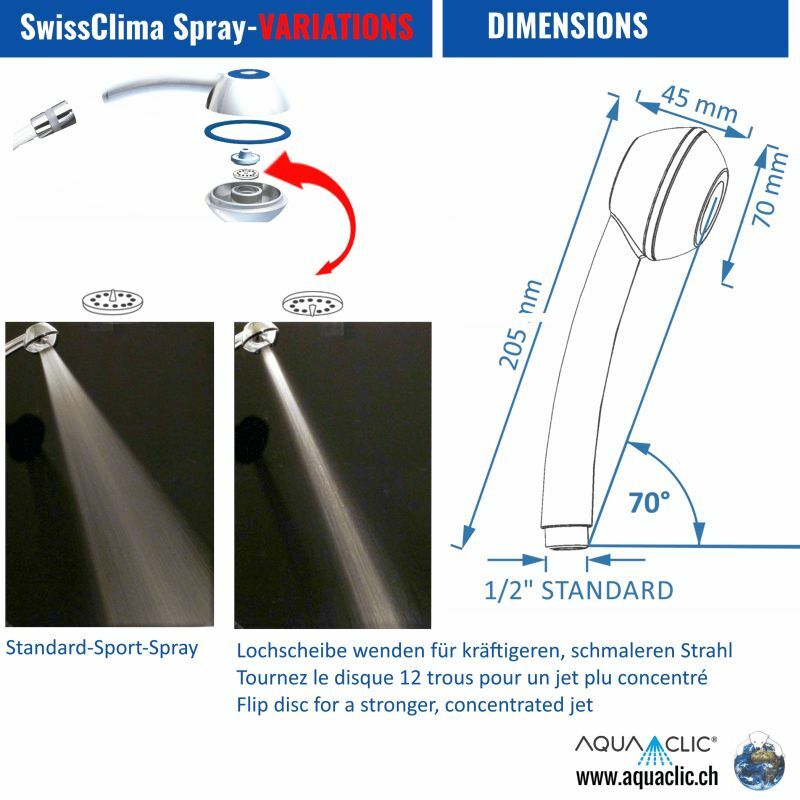 The AquaClic Clima produces a tingling, full spray of water. It does not build up limestone deposits, is hygienic, light and ergonomic. 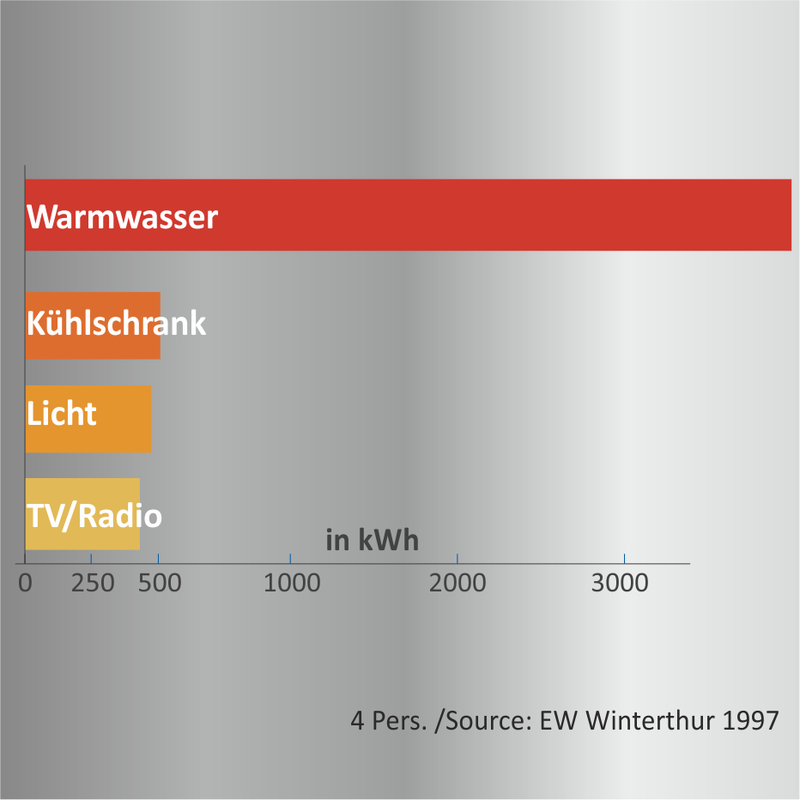 Cut water usage by 50%, while saving energy and money! Enjoy a full-bodied spray, thanks to a sophisticated design. Simply screw the shower head: fits onto any hose. Hygienic and guaranteed against limestone buildup for minimum 5 years. 1 Clima shower head as shown, 11 l / 2.9 gal/min. (by way of comparison: standard showers consume 15-25 l/min. ), with a powerful jet of water. Prefer softer showers? 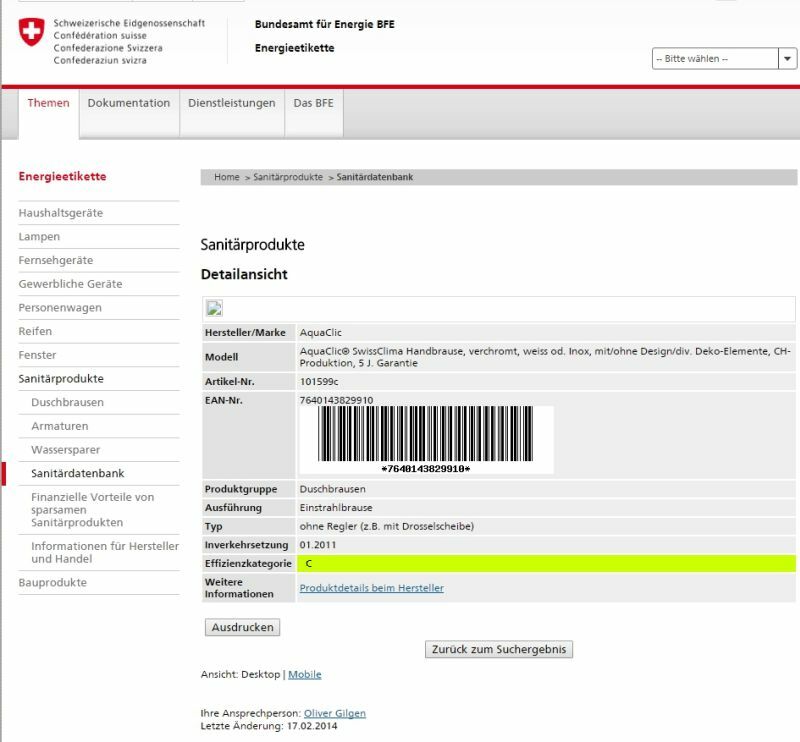 Simply order the Softspray attachment under “Options”. Additional flow controller 3-10 l/min (see "Options", 0.8-2.6 US gal/min), to save even more water. Comes in attractive (gift-)wrapping or functional minimal packaging. Showering uses an especially large amount of water – up to 25 liters / 7 US gallons per minute. This needs a lot of oil or electricity to heat it, produces environmentally unfriendly CO2 and uses a lot of energy. A 5-minute shower uses 3 decilitres (1.2 cups) of oil, for example! Save water although the shower is still powerful? Thanks to its special construction, the Clima forces out millions of tiny droplets. It creates a massage-jet, which would otherwise require twice as much water. Added bonus: the tiny droplets spread the water better – so shampoo rinses out of your hair faster. Clima forces out a powerful spray. Conventional “watering can” spray. 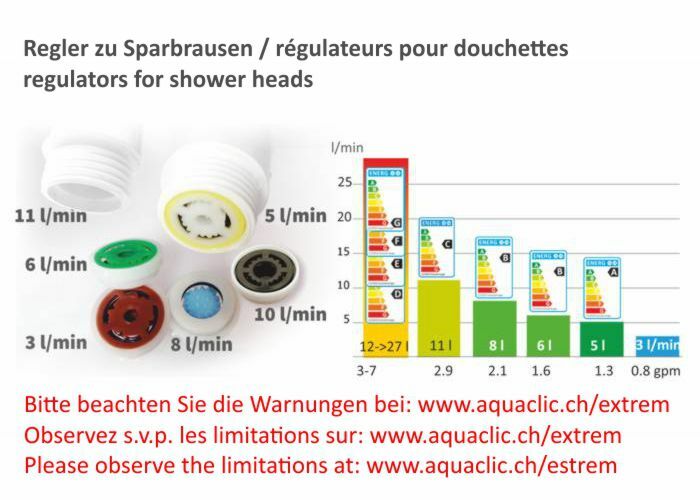 It's special design permits a maximum flow of 11 liters/min (at a normal pressure of 3 "bar"), compared to 15-25 liters per min used by conventional shower heads. You'd rather have a gentle spray? 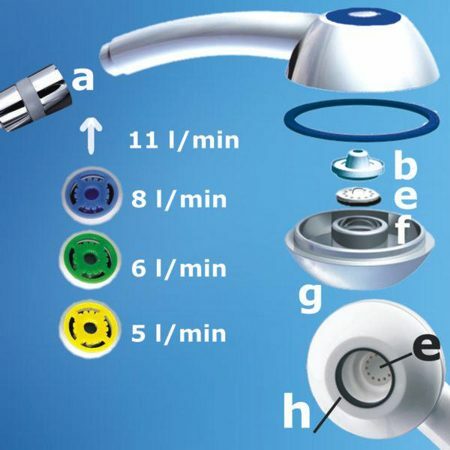 This water-saving shower head uses a maximum of 11 litres (2.9 gal) a minute at normal mains pressure (3 “bar”). Clima shower heads have a standard (half-inch) thread which fits any off-the-shelf hose. A lot of pressure is created, so make sure that your hose is in healthy condition. If you need a new one anyway, take a look at the “AquaClic Flex” hose (in Accessories). A sturdy, durable shower head, made with enough material to last at least 15 years. As little material as possible, for a lightweight, handy and problem-free use. So you won't find any adjustment wheels, little lights, turbines or other movable parts which will sooner or later fall off or scale up. Single-material, separate ABS & POM plastic and rubber components that can be disposed of simply and harmlessly. From an ecological point of view, chromed parts aren't a good idea, especially if they come from distant countries which lack stringent controls (heavy metals, waste disposal, water pollution, etc. read more in our article “Brilliant and ecological – its possible!”). Accordingly, we offer a selection of chrome-free shower heads. 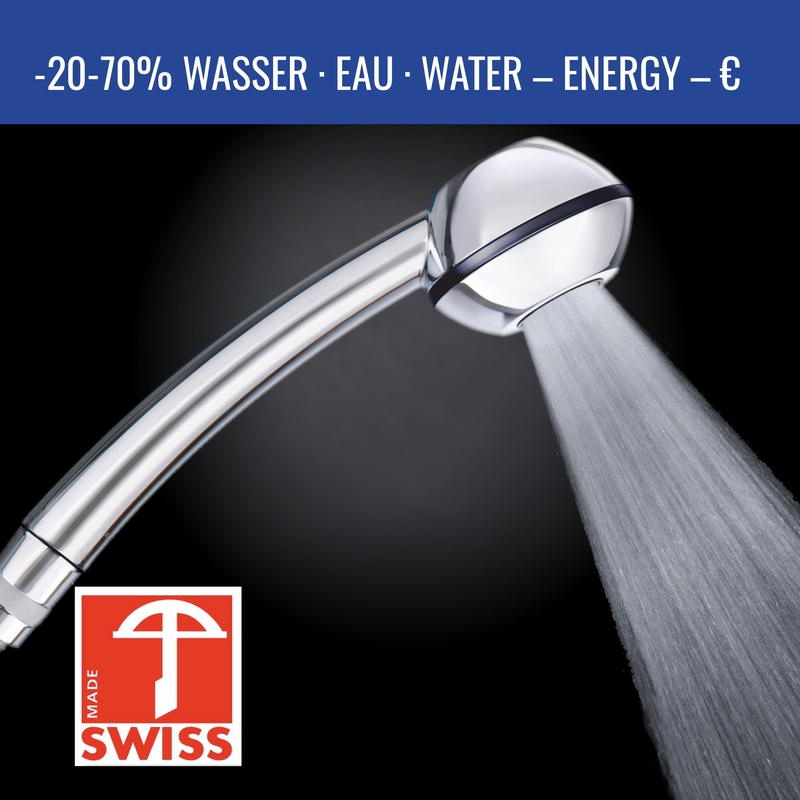 Or the raw stainless steel Elégance shower head. But we also understand if you want a chrome head to match the tap. 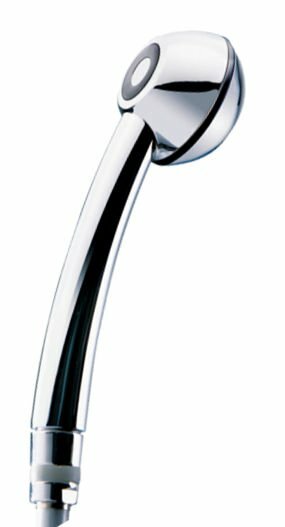 We also supply a range of chromed models. 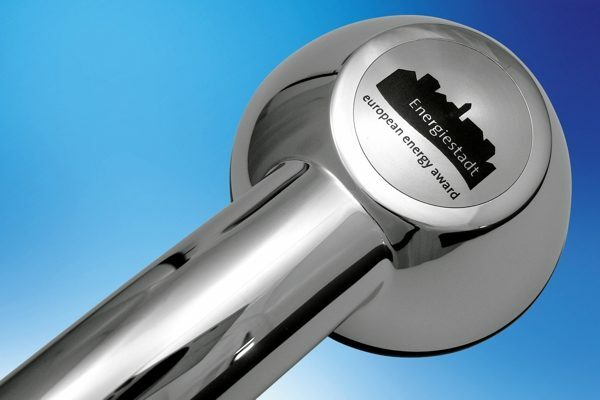 The chrome is applied in Switzerland according to extremely rigorous ecological and food hygiene regulations. This ensures a clear conscience and a durable plating. The Clima is one of the very few shower heads that are really simple to open, just by unscrewing it. After a burst pipe or your holidays, it's easy to remove the old water, deposits or particles of any kind. Your shower stays hygienically clean. Turn your bathroom into a cosy wellness oasis in a flash with one of many Clima designs. And then put the icing on the cake by fitting a matching AquaClic on the faucet. The attractive accessories will constantly remind you and everyone else who uses your shower what precious resources water and energy are, and that we should conserve them. 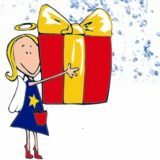 Give as a present or keep for yourself? Why not both? You always cut a dash with an AquaClic shower head, regardless of whether you treat yourself or someone else. Choose a suitable motif from our wide selection of decorative designs and give your friends or customers a special, useful present. A water-saver as an advertising medium?